Our coffee shop near Isle of Wight is the perfect place for you to enjoy a warm cup of refreshing tea or coffee with a friend. It stays open all days of the week and has a short menu with choice delectable items that are loved by us Brits! We have used minimalistic decor and merged it with a refreshing atmosphere to provide our guests a great time, every time they visit us. Above all, there is the best cup of tea you will ever have! We have many kinds of tea available to satisfy your taste buds regardless of what kind of tea you love. From traditional English tea to various popular brands, we serve tea with the best taste and freshness it can possess. For coffee lovers, we have the usual set of cappuccino, espresso, latte, and more, so none of our guests have to sit in our coffee shop near Isle of Wight without their favourite hot drink in their hands. The snacks and little bites we offer in our menu are selected with the same sense of tradition in mind. Our sandwiches are scrumptious, our cheese melts in the mouth, and our biscuits are the perfect solution for your afternoon hunger pangs. The quality is beyond expectations and prices are so good you will not even think about them. When it comes to hunger, some guests want more than just little bites, especially if they decide to come over for breakfast. We have a variety of English breakfasts available in our menu as well as a few options for a proper lunch that we, as British, love. With the soothing ambience in our tea room near Isle of Wight, you will see no need to find another place where you could have a wonderful cup of tea without having to endure loud music and noise. Our minimal design and arrangement of tables allows sufficient privacy and keeps things from becoming a nuisance for you. The chairs are comfortable and, if you want, you can sit in a sofa seat instead. As for quality of our food, all we need to do is remind you that all the ingredients we use are home- or locally grown. This means the bread, cheese, vegetables, and other items we use for our meals and snacks are either grown in our garden centre or in a local nursery or farm. 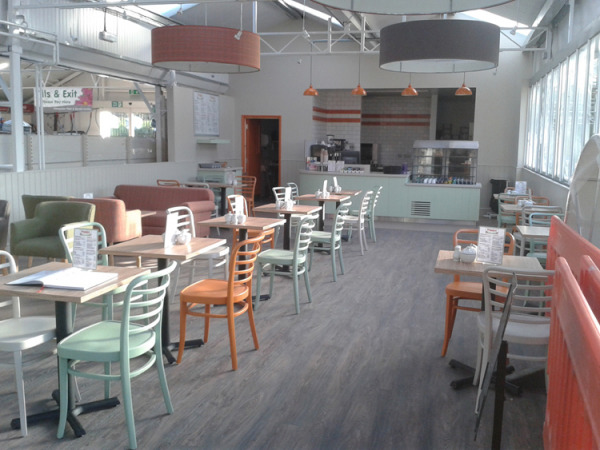 Combine your visit to our coffee shop with a visit to our beautiful garden centre to buy plants, garden furniture, garden tools or for advice about gardening. Need a small party venue? Our coffee shop near Isle of Wight is also available for small parties and you can have it booked by discussing the specifics of your party with our front desk. We can provide you an exclusive section in the coffee shop if your party is limited to a few guests or cordon off the team room completely, depending on the size of the party and your preferences. Visit our coffee shop near Isle of Wight soon for tea you will fall in love with! Combine your coffee with a visit at our garden centre where you will find everything you need for gardening. We have the best plants near Isle of Wight!